Arctic Mission’s furthest North was 80 degrees 10 minutes North, 148 degrees 51 minutes West, reached at 22:04:12 (Alaskan Time, GMT-9hours) on 29 August 2017 by yachts, Bagheera and Snow Dragon II. 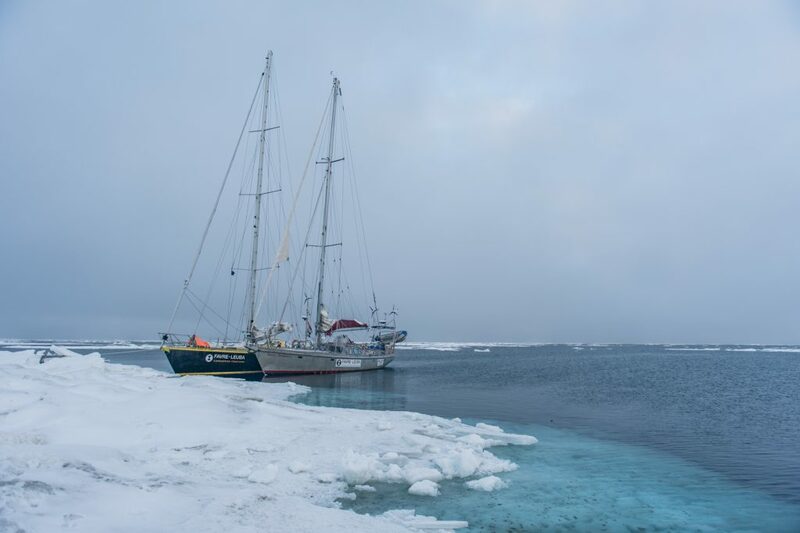 Arctic Mission moored its yachts to an ice floe on 29 August to conduct one of its 24-hour marine science surveys, while drifting with the sea ice. The strategy for any future northward progress had been to monitor the sea surface currents, sea ice, and weather conditions (both observed from the yachts and through satellites imagery downloaded onto our computers), and decide how to proceed as we approached the end of the 24-hour survey. A meeting of the four skippers was held led by Erik de Jong, with Pen Hadow present, and it was agreed further northward progress would increase considerably the risks to the expedition, with very limited scientific reward. The decision to head south, back to an area of less concentrated sea ice in the vicinity of 79 degrees 30 minutes North, was made at 18.30 (Alaskan time). Arctic Mission has demonstrated that commercial fishing and shipping vessels can now access and exploit a new, unexplored and vulnerable ocean region on the planet, the Central Arctic Ocean, due to the melting of its sea-ice cover. Approximately 1 million square kilometres of the Central Arctic Ocean is likely to have been ice-free this summer, having had year-round ice cover throughout human history until the 1980s, and likely has had for many tens of thousands of years. The commercial activities made possible by this loss of summer sea ice puts at risk the extraordinary wildlife that has evolved to survive in this extreme environment. Polar bears, whales, seals, fishes, seabirds, invertebrates and microbes all contribute to a unique and special ecosystem which is unlike any other on earth. Arctic Mission has undertaken an extensive oceanographic, wildlife and ecosystem research programme during the voyage, led by Tim Gordon of the University of Exeter (UK). This has included work on acoustic ecology, copepod distributions and physiology, microplastic pollution surveying, inorganic carbon chemistry, seabird range expansion and microbial DNA sequencing. Scientific findings will be released following comprehensive data analysis and formal publication in peer-reviewed journals in 2018/19. It is believed Arctic Mission has sailed further north from the coastlines surrounding the Arctic Ocean than any vessel in history without icebreaker support. Its vessels were the first to reach the international waters surrounding the North Pole (aka the Central Arctic Ocean), without icebreaker support and without freezing in. Its vessels have set the first furthest north within the Central Arctic Ocean without icebreaker support.